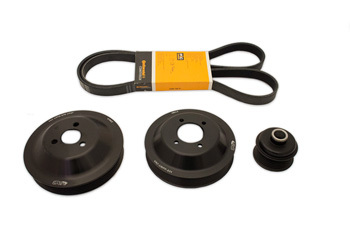 Our Underdrive Power Pulley Sets release 10 horsepower @ 6900 RPM and 8 lb/ft of torque @ 5500 RPM (measured to the wheels!). Always made using only virgin billet aluminum, a handsome anodized finish, and the tightest tolerances; our pulleys are used on some of the fastest BMWs on the planet. Our very lightweight design optimizes performance and response while under-driving components just the right amount for proper function at all RPMs. Quality is always #1, and you can be sure these pulleys will fit right and last a lifetime, replacing BMWs crack prone plastic pulleys. From Elie of Andover, Massachusetts on 8/22/2015 .